Content with the handmade cheer I’d poured into our home, I set about lavishing it on a few of my loved ones. My sister-in-law and dear friend Heather is a collector of mismatched socks, and it only felt right that she should have a truly special handmade pair in her sock drawer. I’d entertained the idea of making her socks last year, but chickened out at the last minute—I had no doubt she was knitworthy, but I thought there were other things she needed and would enjoy more. 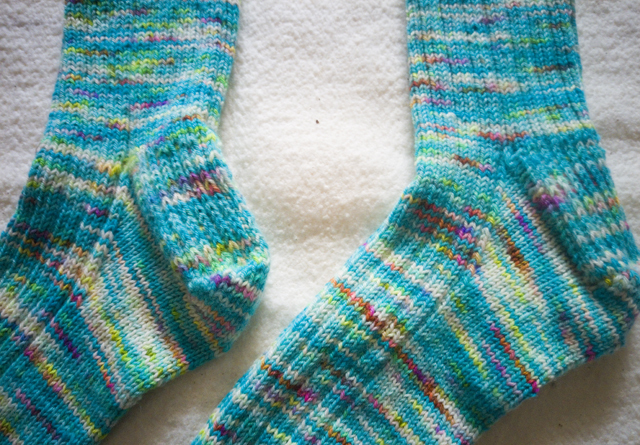 With Justin’s encouragement, I threw my doubts aside and cast on Glenna C’s A Nice Ribbed Sock. The yarn is Hedgehog Fibres Sporty Merino in color Bubble, from my beloved LYS Warm ‘n Fuzzy. I made my usual adjustment of going up a needle size, but otherwise knit the pattern as written. Details (like the length of the leg and foot to fit a women’s size 9.5 shoe) can be found on my Ravelry project page. I was lucky enough not to suffer second sock syndrome, although I was a little rushed to finish them before we got on the road to see everyone for Christmas. I managed to make my right wrist and forearm rather sore for about a day, which is all the warning I need to take it easy on future projects! Heather loves them and has hinted that she wouldn’t mind another pair, if I felt so inclined. 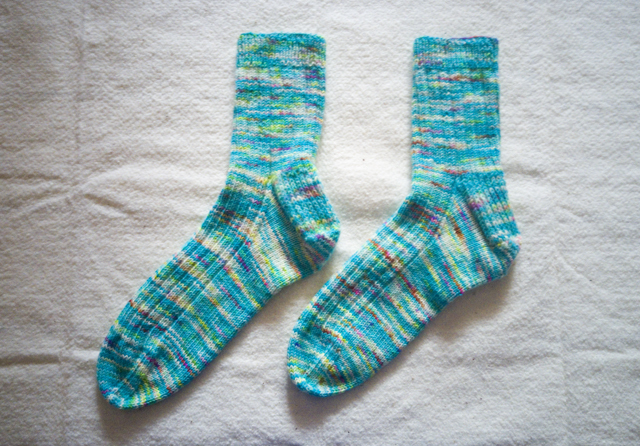 I’m a bit jealous, though, as I don’t have any handknit socks of my own, so she may have to get in line! 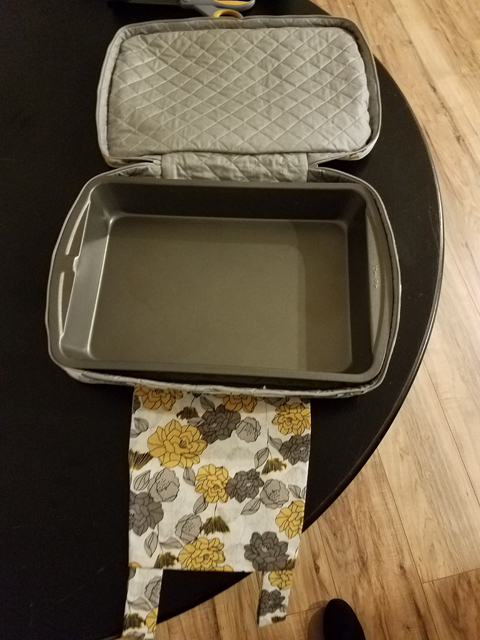 My second gift, and the biggest undertaking of my four Christmas projects, was a casserole carrier for my sister, Loren. She loves to cook, and on many occasions she’s taken meals to friends: to celebrate special occasions, to take care of them when they weren’t able to cook for themselves, or simply to enjoy their company. Transporting a steaming pan of lasagna or enchiladas across town isn’t exactly a cakewalk, though, and last year she casually mentioned that she was looking for a carrier to make it easier to bring hot dishes to potlucks and the like. As with Heather’s socks, I thought a lot about making her this gift, but again, I lost my nerve. I doubted my sewing was up to the task, feared she wouldn’t like pattern or fabric I picked. I settled for other things I knew she wanted, things that felt easy and safe. You have to understand, though, that my sister is really, really good at giving gifts. She’s attuned to everyone’s changing hobbies and evolving interests. She’ll be out shopping and see something that reminds her of you, and she’ll bring it home. Maybe she sets it aside for a birthday or holiday; maybe she gives it to you right now, just because. She also has a knack for searching out something you want and, when she can’t find the exact thing, picking something else that you end up liking even better. I felt I’d let her down when didn’t make her the casserole carrier, but she graciously didn’t say anything more about it, and I squashed the feeling until it didn’t bother me anymore. It bubbled up again—boiled over, really—when, a full year later, she mentioned a casserole carrier again among the things on her wish list. She was quick to qualify her wish by saying it didn’t need to be handmade, purchased would be fine too if handmade was too difficult—but handmade would be very nice. Well. That settled that. I wasn’t about to buy this thing when I could, after all, make it. I had my brief; I set to work. The pattern is Simplicity 1236, which offers carriers for a 9″ x 13″ rectangular baking dish and a 2.5-quart oval dish, round bowl covers in three sizes, and soft-sided dishes similar to a key tray or bedside catch-all. 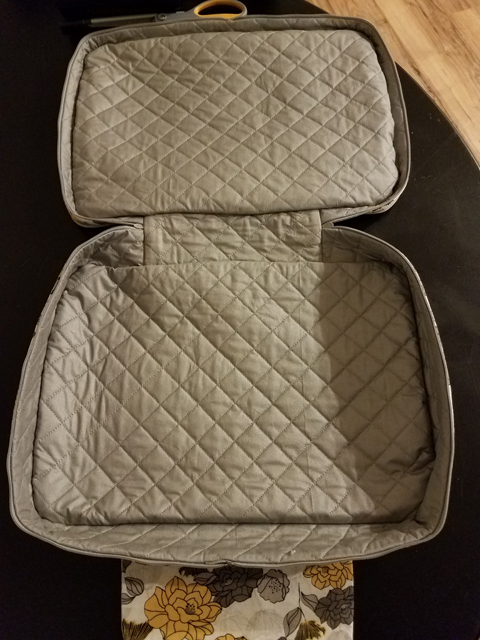 The rectangular casserole carrier has a quilted lining, double-zipper closure, decorative piping, and loops to hold a wooden spoon or dowel to create a handle. The pattern calls for “quilted ironing board cover fabric” for the lining. The only ironing board fabric I could find (at JoAnn) was un-quilted. Instead of searching online, placing an order with another vendor, and waiting for it to arrive, I did the only logical thing I could think of at the time: buy twice as much fabric and a package of cotton batting and quilt all of the lining myself. I relied on my walking foot with quilt guide to get the lines spaced evenly at 1 inch apart on the bias. Initially it was quite easy and mindless to sew, though by the end I definitely got bored and was ready to move on. 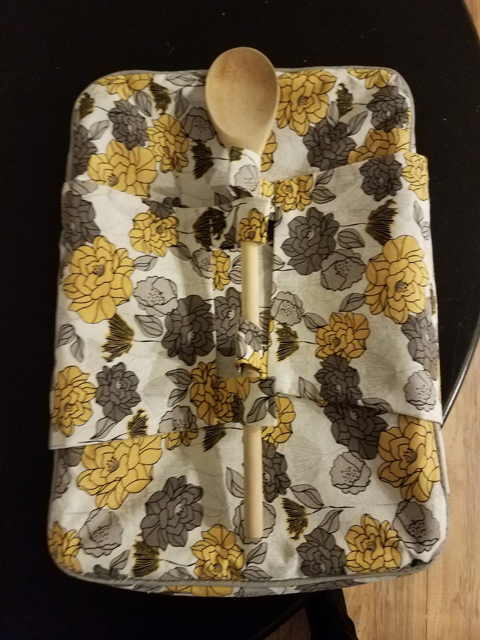 Since I knew I’d committed a fair amount of time to making the lining, I went ahead and purchased coordinating piping rather than making my own, and I have no regrets about that. I was able to get a pretty good match between the piping, zippers, and light grey flowers. I followed the assembly instructions to the letter, and I’m happy with how neatly things came together overall, especially considering I don’t have a lot of experience doing three-dimensional corners. As you can see above, the entire inside is clean finished; there’s only a small amount of hand-sewing needed at the “hinge” to accomplish it. There are only two things I would do differently. The first thing would be to interface the handles, which felt a bit flimsy. (I entertained the idea of making a second iteration out of a sturdier material like canvas, but I’m afraid that it would get too bulky to manipulate at the end, especially easing the corners). The second thing would be to find a way to invisibly (or at at least subtly) tack the lining to the shell. As designed, the two are connected at the edges but not the centers, which provides that lovely clean finish but means that the two have a tendency to separate. I don’t think it’s even noticeable when there’s a dish in the carrier, but again, it makes the whole thing seem a bit flimsier than it probably is. Loren seemed genuinely delighted when she opened this up on Christmas morning, and excited to put it to use. I hope that it holds up well and stands her in good stead through many family-style dinners and special gatherings. ‘Tis the season for overdue 2017 project posts! On this, the one month anniversary of Christmas, I have a few holiday-inspired projects to share. Today I’ll share two things I made for us at home, and tomorrow I’ll be back with two gifts that I made for family. 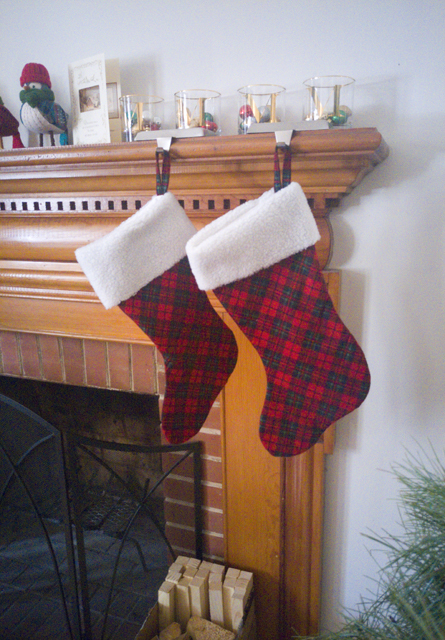 The first things I made were new, matching Christmas stockings for Justin and me. My own childhood stocking is very dear to me because it was sewn by my mom, but it’s often too small for the things intended to go in it: it doesn’t fit a paperback book well, which is a perennial favorite filling. Justin’s stocking, which he got after we were married—his childhood stocking still lives at his parents’ house—is larger but store-bought. I’d wanted to make new stockings for several years, but each time I ran out of time or energy and had to let go of the idea. This season, however, I was overflowing with holiday spirit, and I was determined not to let it go to waste. I polled Justin on what he thought the stockings ought to look like, and he was overwhelmingly in favor of tartan bodies with a fur or fuzzy cuff. He ended up picking out both fabrics from JoAnn: a crimson and evergreen snuggle flannel (which has a printed rather than woven design) and a faux lambswool (because the faux wolf fur that he wanted was laughably far outside the budget, even for this small project). I chose to line the stockings in leftover white cotton sateen from my stash. For the pattern, I traced Justin’s stocking and fine-tuned the shape until I’d achieved what I believe to be the Platonic ideal of stockings. I have strong feelings about the proportion of shaft length to width and the angle of the toe, and I was vocal about my opinions while browsing inspiration online—high-end and charmingly homemade stockings alike suffered my scathing opinions. It’s really no surprise I needed to make my own to get what I want. 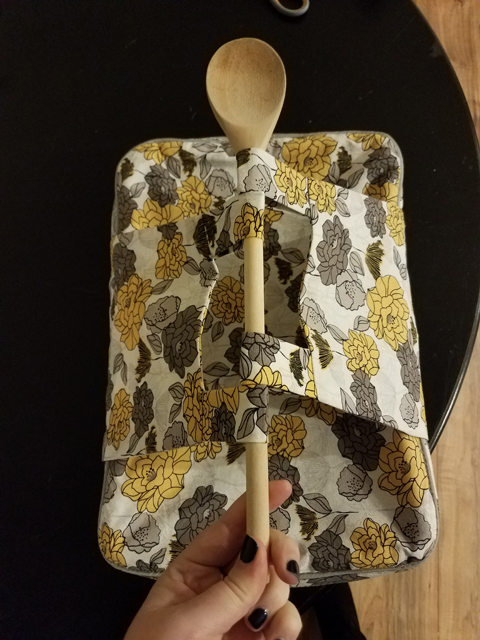 I was pretty sure I’d figured out how to assemble everything to get a clean finish and include a hanging loop, but just to be safe I referenced this tutorial from Cluck Cluck Sew to make sure I didn’t have to tear anything apart and sew it again. The result is exactly what we’d both envisioned, and they served wonderfully to hold this year’s goodies from Santa. 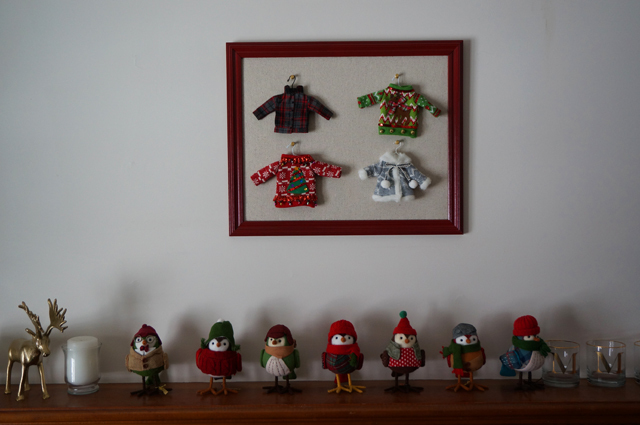 Next up is a bit of holiday decor inspired by these adorable tiny sweaters that we bought at the Container Store last year. They’re sold as gift box adornments and tree ornaments, but we hung them straight on the wall by our front door last year. This year, I wanted to give them a little more weight and make them feel like an intentional part of the decor, so I mounted and framed them—quite inexpensively, too! To determine roughly what size frame I was looking for, I laid out the four sweaters on the floor, spacing them comfortably, and took measurements of the minimum length and width I’d need. Then I popped into our local thrift store and perused the framed art section until I found a decent-sized frame that I liked. I think it cost me $6–$7? It held a print of a floral still life. I removed the staples holding the cardboard backing in place, then separated the layers: glass, frame, and matted print. I set the glass aside and spray painted the frame with three coats of cherry red paint. I turned the print over so that the back was now the front and wrapped it—matte and all—in a linen-look fabric from JoAnn, stapling it in place with regular-duty office staples as close to the edge as possible. I didn’t want to go out and buy a package of gold push pins, so I took plain white ones and painted them with a little gold acrylic craft paint I had lying around. (It took a couple of coats and was kind of a pain, but it was effectively free for this project.) When they were dry, I dabbed a little Gorilla glue (again, what I had lying around) on the flat underside of the pin that would be against the fabric and pushed them straight through the fabric-wrapped print. The points stuck out too far in the back, so I tried bending them down with needle-nose pliers, but that didn’t really work; I resorted to using the pliers to snip the tips off, and that seemed to work just fine. Once the glue tried and the pins were firmly in place, I placed the wrapped print in the frame. To secure it, I followed the advice on Decor Adventures to use glazing points (also called glaziers points), which I purchased at Lowe’s. From there, it was a simple matter to move the sawtooth hanger to convert the frame from portrait to landscape orientation, tap a picture hanging brad in the wall, and hang both the frame and sweaters. The sweaters aren’t permanently attached to the pins, so if I ever change my mind I can easily use them in a different way. I’m ridiculously pleased with the outcome of this little piece of art—it’s still hanging up, and it makes me happy every time I come in the house. During the first quarter of 2017, Justin was let go from his office job and was put in a position where he needed to take temporary work for a time. Options were sparse, however, and he ended up in a more a physical job than he expected, one that had him on his feet all day handling things that were frequently sharp, greasy, or caustic. There wasn’t a strict dress code, so for the first couple of months he kept wearing his favorite t-shirts and polo shirts to work. His motive was understandable: faced with mindless tasks he didn’t enjoy in the sub-basement of a company that didn’t value him as an (expendable, temporary) employee, he clung to the one thing that made him feel like a person. Who can blame him? Unfortunately, several of his shirts quickly sprouted holes, grease stains, and bleach marks. 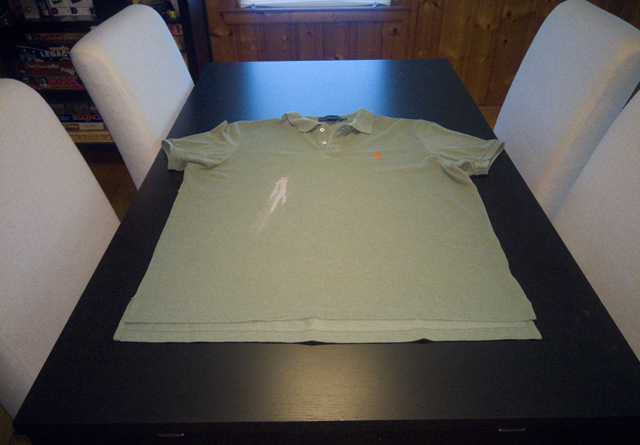 One of those shirts was a particularly nice polo from Ralph Lauren, in a flattering shade of green, that he’d received as a gift for Christmas. The stain was too large and too prominent to cover up discreetly, but I was loath to throw away a good shirt that was otherwise in pretty decent condition. After eyeballing it several times and then trying it on (it was a men’s XL), I decided I could salvage it by turning it into a dress for me. I knew the dress had to have princess seams to avoid the stain, and I didn’t have anything in my pattern stash like that. 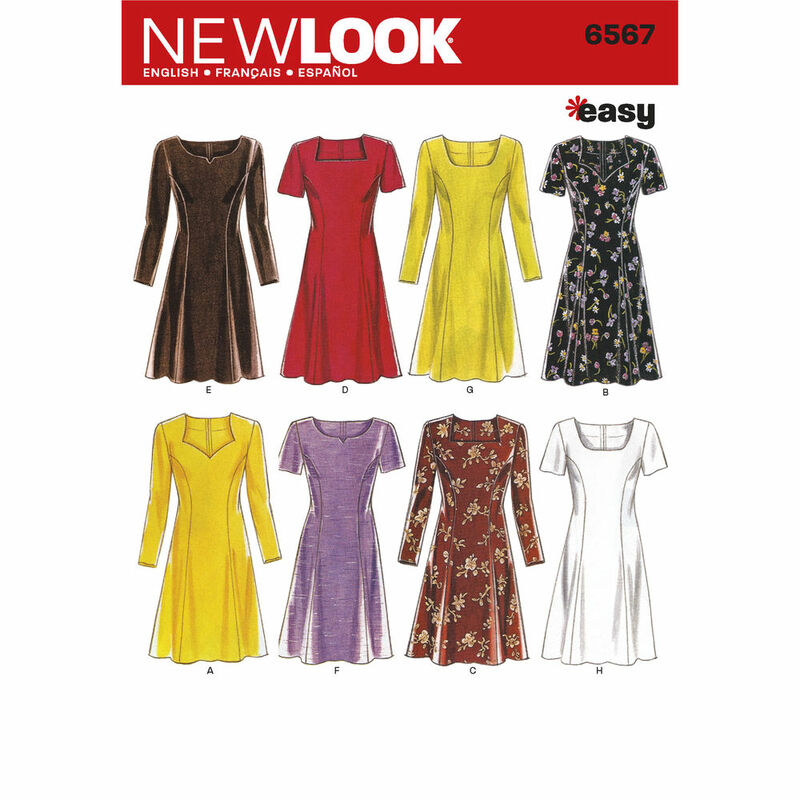 After flipping through both online and in-store pattern books, I settled on New Look 6567. 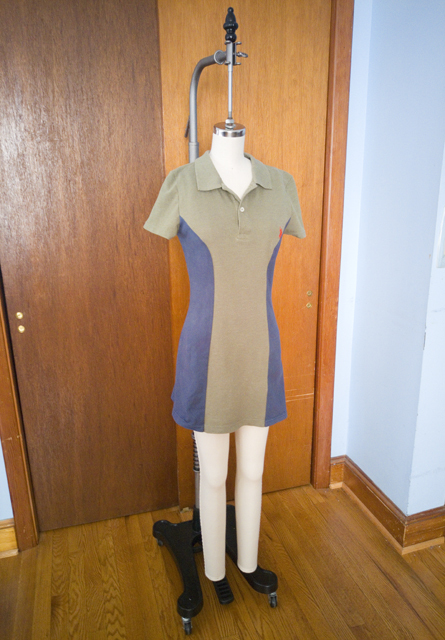 It’s designed for wovens, but it was the only pattern I could readily find that had the style lines I was looking for. I ignored the various neckline options and the back zipper, since I planned to preserve the original collar and placket and leave the dress a pull-on affair. 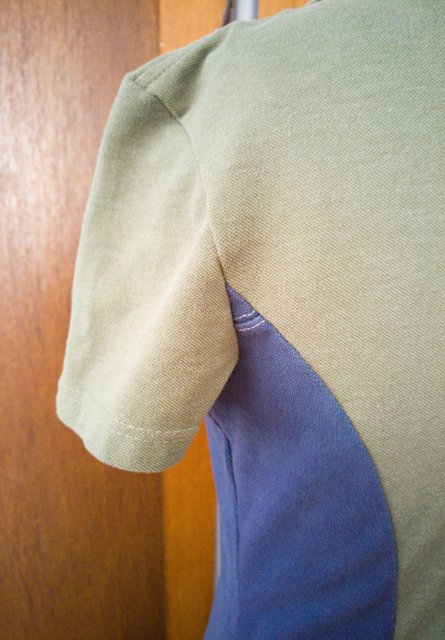 I cut the shirt apart at the side seams and removed the sleeves, but left the front and back attached at the shoulder and left the bottom hem intact. 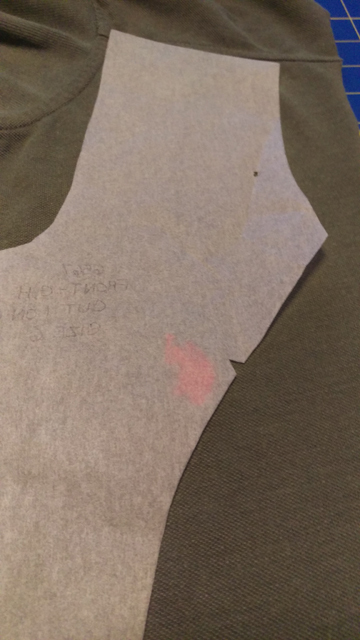 Based on my measurements and what I thought was an acceptable amount of ease, I traced a size 6, and then proceeded to shift the pattern pieces around on top of the shirt until the grainline was parallel with the center front and the slope of the shoulder on the pattern roughly aligned with that of the shirt. I had to dodge the bleach stain, and I also wanted to preserve the logo embroidery if possible—I liked the contrast of orange on green. 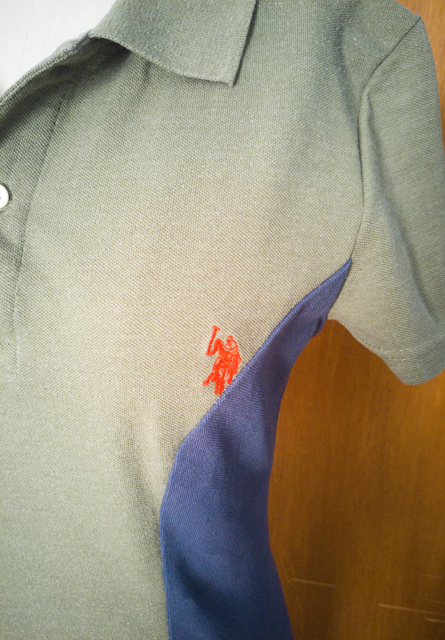 I briefly despaired, then raided Justin’s closet and dug out another polo shirt that was destined for the refashioning pile. This one was a different brand with a different cut, and it was white. The shape didn’t matter so much since I was cutting the pieces out of the middle, but I decided the white was too stark a contrast, so I over-dyed it navy using Rit liquid dye leftover from a Halloween costume project a few years ago. As with my other dyeing experiments, I used the stovetop method and it worked a treat. With these cutting hurdles behind me, the dress sewed up quickly. 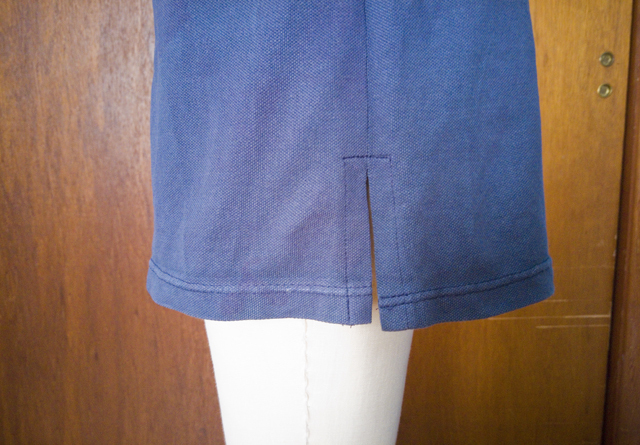 I basted everything on my regular sewing machine and then sent it through the serger to seam and finish the edges. The logo just narrowly avoided being eaten by the seam. Perhaps the only thing that would give away the secret of this dress’s origins are the teeny, tiny seams near the back underarm, which were the part of the shoulder seams on the white-shirt-turned-blue-shirt. A split hem seemed a like a classic design choice. The back of the dress ended up several inches longer than the front, so I ended up cutting off the excess and re-hemming the back in coordinating thread for each panel. Overall I like the way the dress turned out—it looks pretty much exactly like I envisioned it—but it’s just a little too snug and a little too short to feel comfortable walking around in. (These dress form shots are a bit deceiving, since it hasn’t been padded out to my measurements yet.) I can see that I overestimated how much the pique would stretch horizontally when choosing a size, and what felt long enough in a baggy cast-off is different from what feels long enough in a more figure-skimming silhouette. If I do a refashion like this again—I’m definitely interested in trying, I’d just need to thrift a couple more shirts—I’ll size up in both pattern and shirt so that I can get the fit I’m looking for. Since I don’t know anyone smaller than me, this dress is headed to the thrift store, but at least that’s better than heading to a landfill, right?